America loves a winner. From “Rocky” to the 1980 USA Olympic Hockey Team. We love winners. Short of (allegedly) murdering your ex-wife and a waiter, we are willing to forgive a lot as long as you win. We love winners more than we love ourselves. Once you are a champion we will gladly welcome you into our hearts. After the Los Angeles Lakers defeated the Boston Celtics in Game 7 of the NBA Finals only one question remains: Is America ready for Ron Artest? We all remember where we were when the name “Ron Artest” first came into our collective consciousness. It was November 19, 2004. The Indiana Pacers were visiting the Detroit Pistons. With less than a minute left in the game, whose outcome had already been decided, Artest and Detroit center Ben Wallace got into an altercation. That fight led to a Detroit fan throwing a drink at Atrest. Ron snapped and went into the stands and started swinging. More Pacer players followed him and a full scale riot broke out. The fighting even spilled onto the floor. It was probably the worst day in the history of the NBA. The fallout was quick and swift. In all, nine players were suspended without pay, with Artest getting the worst of it. He was suspended for the remainder of the season. Legal charges were filed against Artest and others. Ron pleaded “no contest” and was sentenced to one year of probation, 60 hours of community service, a $250 fine and was required to attend anger management classes. Most people pointed the finger at Ron. This was all his fault. He was crazy, uncontrollable. Commentators went so far as saying he should be banned for life. Fans wanted him in jail. Ron Artest had become the Most Hated Man in Sports. Fast forward to June 17, 2010. Game 7 of the NBA Finals. 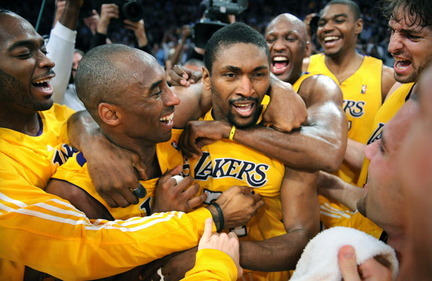 Ron Artest is the only bright spot for the Los Angeles Lakers. While Kobe Bryant and Pau Gasol were struggling to get any kind of offense going, it was Artest who was carrying the team. He was the leading scorer in the first half. He was playing great defense against Pau Pierce. With 1:02 to go in the game he hits what will probably go down as the biggest shot of his career; a three pointer that put the Lakers up 79-73. The best part about that shot was Ron Ron running back on defense and blowing kisses to the crowd. Classic. Throughout this season Ron took an incredible amount of criticism from fans and media alike. Many people were saying that the Lakers would rue the day they did not re-sign Trevor Ariza. And with every missed three pointer, every blown defensive assignment and every mistake Artest made those voices grew louder and louder. But in the biggest game, on the biggest stage, Ron Artest stepped up and played like a champion. He single handedly saved the Lakers season, Kobe’s legacy and the city’s pride. Ron Ron was the MVP of Game 7. It’s amazing what winning a championship can do for a person. All of a sudden, all those traits that you used to think were strange or even repulsive now become quirky, even endearing. Winning forgives a lot of sins. It’s always been that way. In six short years Ron Artest has gone from social outcast to the King of LA. America, say hello to the new Ron Artest; eccentric, savior, champion. At first I hate Artest but when he join lakers I started to like him . Celtic Fan Sets Himself on Fire!! !